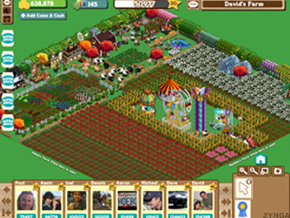 The 'Farmville' creator is hoping to capitalize on investor frenzy surrounding Internet companies. NEW YORK ( TheStreet) - Zynga, the creator of the popular "Farmville" game on Facebook, is close to filing an initial public offering, according to reports. The filing may come as early as this week, according to tech blog AllThingsDigital, although subsequent reports said a June timeline was more likely. Zynga may be close to filing for an initial public offering. Zynga's plans to go public come on the heels of LinkedIn's ( LNKD public offering last week in which the shares more than doubled on their first day of trading. On Tuesday Yandex ( YNDX - Get Report), the so-called Facebook of Russia, saw shares surge 55% after its IPO and became the largest Internet offering in the U.S. since Google's ( GOOG - Get Report) in 2004. Strong demand for Internet and social media-based companies has allayed some investor's concerns that the tech sector is overvalued and is reminiscent of the dot-com boom and bust. Wall Street is already preparing for eventual IPOs from heavyweights like Facebook and Groupon, which are expected sometime next year. Online music radio company Pandora already has filed to go public, as has vacation rental company HomeAway. Zynga has a $8 billion valuation, according to SharesPost, a secondary market for trading shares of privately held companies. The company's worth tops that of public video game publisher Electronic Arts ( ERTS, which has a $7.8 billion market cap. Last month, Zynga hired former EA Chief Operating Officer John Schappert in a senior executive role. Zynga makes money from the sale of virtual goods -- digital items that gamers buy with real cash such as a cow or corn on "FarmVille." While most virtual goods cost from $1 to $3, these figures can add up -- the U.S. virtual goods market alone is expected to reach over $2.1 billion this year, up from $1.6 billion in 2010, according to research firm Inside Network. In February, Zynga was reportedly in talks to raise $250 million in funding at a $9 billion valuation. The company is profitable and generated about $850 million in revenue last year.